The ambulance sped through the dark night. Rosh lay unconscious on a portable stretcher inside the ambulance. His life ebbed away slowly like sand slipping out of his lifeless fingers. Isha sobbed silently as the tireless paramedic seemed to be losing his battle to protect the life of her husband. The ambulance driver was instructing the hospital on the radio, "Stroke Emergency. Patient is critical." "Wife reports that he collapsed on hearing about substantial financial losses and margin calls suffered in the share market crash today." "Prepare Operation Theatre. Advise Cardiology of the emergency and page the surgeon. We will be at the hospital in 20 minutes." "Patient will need to be operated on immediately..."
Rosh’s wife and his two kids waited helplessly outside the Operating Theatre, worried about Rosh’s fate and their own. The surgeon and his team fought a long and bitter battle inside. The door finally opened and the surgeon emerged. His tired eyes were smiling. His team had snatched yet another life away from death. A silent tear rolled down Isha’s cheeks as she hugged both her sons with relief. Her prayers had been answered. Another day had begun. Later that afternoon, Rosh opened his drugged eyes and noticed Isha and his sons sitting beside him on the hospital bed. She was smiling through wet eyes. Hosh held his heavy hand in his warm palms. Rosh smiled weakly and replied, “I’m Jesus’ Sower. And I’m tried.” The effort to speak was too much for him, and he felt tired and weak. Hosh related the Parable of the Sower to his younger brother, “Jesus talked of a sower who once went out to sow. Some of his seeds were eaten by the birds, and some fell on stony ground where there wasn’t enough soil." "So when they grew, they couldn’t take root and because they had no depth, they scorched and withered, and died soon." 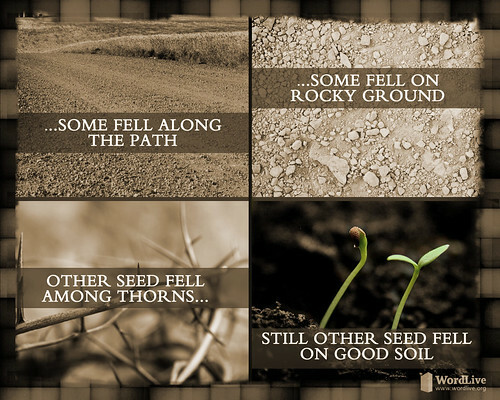 "Some seeds had fallen amongst thorns. The thorns grew up and choked the seeds, so these seeds died too." "But some seeds had fallen on good fertile ground. These blossomed into strong young trees and produced a crop, multiplying the Sower’s initial seeds many times over." Immersed in thought, Hosh answered, “Only he can tell us that. But I can try and guess. Our father is an investor. He diversified his investments, sowing his seeds in various business ventures." "Some couldn’t bear fruit because the birds took them. External agencies and events, which he had no control over." Next Story: Am I Rich Soil?